About Us | FUN Enterprises, Inc.
FUN Enterprises, Inc. is an entertainment company that provides interactive event experiences for college, corporate, wedding and private clients. The number one thing you should know about us is that we are a customer service based company. We pride ourselves on the exceptional customer service we provide, the working relationships we establish and our reliability throughout the entire event process. After 27 years in the entertainment industry we have learned it takes more than great products to keep clients, it takes great service and reliability. We understand that you have one opportunity to make lasting memories and we won’t let you down! 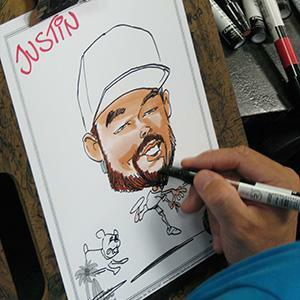 Over the past two plus decades, we have grown our small entertainment business to include over 25 artistic programs including airbrush and caricatures, over 50 photo and personalization programs, craft programs, performers and entertainers. We can personalize almost any product with your picture, name, or company logo, and can brand an experience your guests will never forget. About 5 years ago, we had the opportunity to represent nationally recognized Speaker, Consultant and Leadership Trainer, Michael Miller, and begin a new chapter for the company. Since then we have happily welcomed several more speakers: Author, Speaker, and Humorist, Amma Marfo; Author, Illustrator, Activist and Speaker, Joel Christian Gill; and our newest addition to the team, Trainer and Motivator, Dave Zamansky. In 2018, we launched a new division, SPEAK, which focuses on providing educational and motivational speakers at both the corporate and college level. In 2016, we opened an office in Tacoma, Washington to expand and build our customer base in the region. We are very proud to be a part of close to 2,000 events every year. At Fun Enterprises you will receive the same great care regardless of your event being for 20 people or 20,000 people. Whether you’re looking for an entertainment component to add to your event, or full service event planning to help design and manage your function, Fun Enterprises will create the perfect experience for you.